his book is not a substitute for a lawyer. It is intended to offer a great number of tips to help a parent and student become familiar and self-assured while negotiating on an infraction, or before a disciplinary action is needed. The chapters will direct you from the beginning to the end on the disciplinary process, informing you of specific steps to protect the rights of your child. It gives you tips and illustrations to use as a parent and child to build a better relationship with the family, school district employees and members of the society. It stresses the importance of self-respect and accountability. Several chapters address the witness and testimony, and how to acquire evidence for a school hearing or a criminal proceeding. It also will alert you about the steps generally used in an administrative disciplinary hearing. 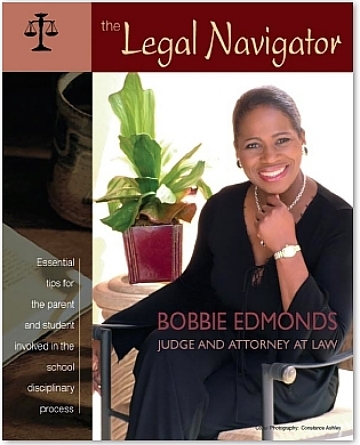 Attorney Bobbie Edmonds' new book, "The Legal Navigator," will enlighten you on how to seek additional information to help your child in school related matters, including but not limited to, discrimination based on disability, race, etc. 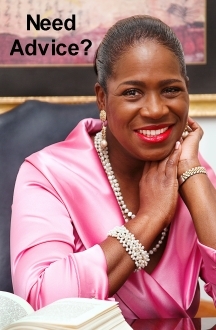 I covers the details of how a parent and child should react under pressure when their child faces an alleged school infraction, or a criminal procedure as a result of an alleged violation of a school conduct rule. The tremendous benefits of "The Legal Navigator" will forever be entrenched in the membrane of your mind. It is a helpful tool to share with neighbors and church members. Pastors can use it as a counseling device to inform their membership to seek a lawyer for proper advice when faced with a legal problem. The local school board trustees should use it as a means of helping to educate the student body on the importance of the school district's student code of conduct handbook and adherence to its rules. Professionals can use "The Legal Navigator" as a teaching tool. Other entities such as the PTA, Teachers Association, social workers and volunteers dealing with youth issues may use it as legal guide to be more effective in their plight for fairness in the school disciplinary process. "The Legal Navigator" $15.99 U.S.
We take your privacy concerns seriously and we strive to earn and keep your trust. We do not share your personal information. Purchase with confidence that we will provide you with a satisfactory and positive shopping experience. Our ordering system is secured with PayPal encryption technology. Please note you DO NOT have to have a PayPal account to purchase from this web-site. Pay securely using your Visa, MasterCard, American Express, Discover, Bank Account or PayPal Funds. You do not have to log in to PayPal or open a PayPal account to complete a purchase. Goodverdict.com © 2000 - 2007 All rights reserved.